We had an overnight stay at Las Casas Filipinas de Acuzar (Las Casas) in Bagac, Bataan last weekend. Las Casas is not only a beach resort but a heritage community as well. Las Casas is most notable for its casas or restored Spanish-Filipino homes. Its period-themed accommodations and skillfully crafted architectural designs allow the guests to travel back in time to catch a glimpse of 18th century Philippines. Of the six dining places in Las Casas, we were only able to try La Bella Teodora, a restaurant that offers authentic Italian cuisine. Located at the romantic Casa Biñan, La Bella Teodora can accommodate up to 100 guests. And because the weather was good when we were at Las Casas, we were able to experience a candle-lit dinner by the Umagol River. 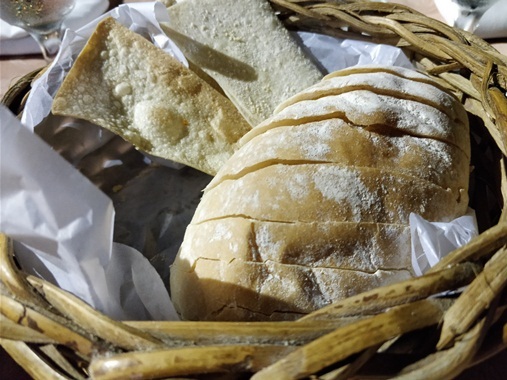 Our appetizer consisted of a small basket of white, soft and warm complimentary bread with olive oil and balsamic vinegar dip. This was good! Guests have a choice of spaghetti, fettuccini or penne for their pasta dishes. We opted for spaghetti for both of our pasta orders. 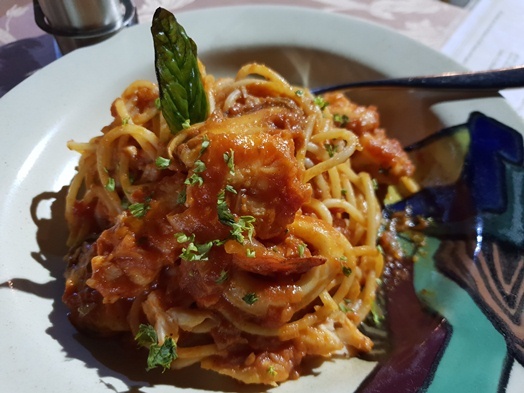 This Marinara pasta has tomatoes, white wine sauce and assorted seafood. Everything about this pasta dish is heavenly; the squid was tender, springy (not chewy) and you could actually taste the freshness of the ingredients in every bite. The price of Php520 for the pasta items on their menu is quite stiff, though, for a serving that’s good for only one person. Our young man requested for his ultimate favorite Carbonara. He truly enjoyed this because there’s no ingredient here that he doesn’t like, just pasta, cream and bacon. Other restaurants include green peas in their Carbonara recipes, and Justin doesn’t like that. The sauce of this Carbonara is thick and creamy, it had generous amount of bacon bits and the taste was just right, not bland or salty. It’s simply delightful! Baked in a wood-fired oven, this Quattro Fomaggi is a thin-crust pizza with four Italian cheeses. It took a while before this could be served on our table, and we actually wondered why, so we asked. Our server told us that they had to redo the pizza because the first one was not perfectly done. That to me means they only give their customers the best, so the longer waiting time was okay with us. 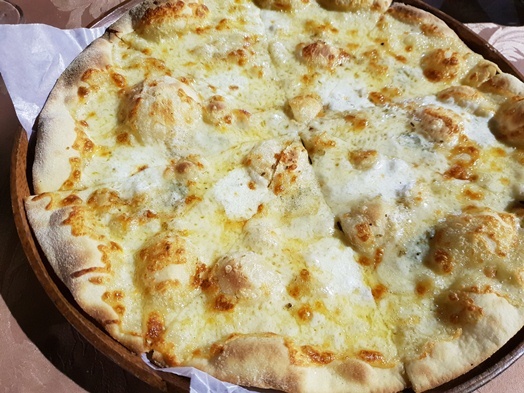 We relished this pizza’s crispy crust and soft and slightly chewy dough that’s oozing with cheesy goodness. Our tummies were happy and content when we left La Bella Teodora. We didn’t even crave for desserts anymore. 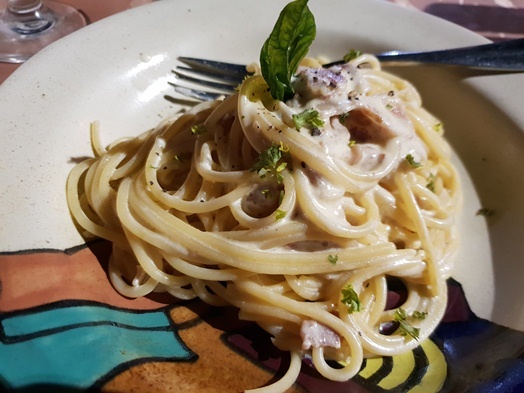 This entry was posted in Al Fresco Dining, Candle-Lit Dinner, Carbonara, Italian Cuisine, La Bella Teodora, Las Casas Filipinas de Acuzar, Marinara, Quattro Formaggi. Bookmark the permalink.